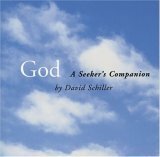 Today at Barnes and Noble, this book, "God: A Seeker's Companion," caught my eye. So picked it up and read bits and pieces of it. It was about 1/3 fanciful, 1/3 heretical, 1/6 thought-provoking, and 1/6 biblical. And I think those add up to 1, but there was also overlap (i.e. "biblical" should also be "thought-provoking," and "thought-provoking" can also be "heretical"). Anyway, I'm putting this book on my "might buy" list because I thought it would provide some good conversation-starters, particularly if I were in an evangelistic context of exploring the Gospel. Or if I were trying to teach people how to interact with someone who had a bit more ... "open" view of God. I'd ask, "What's good about this quote? How does it seem to connect with the speaker?" Then I'd ask, "What's wrong with the quote? How does is the speaker trying to make God into his or her own image, rather than submitting to God's revelation of Himself?" Finally, I'd ask, "What in God's Word 'scratches the itch' of this person? How can you present the Gospel to this person in a compassionate way?" But I don't know if all that would be worth the $8 I would spend on the book. So I'm thinking about it. If any of you people out there would like to buy the book for me, I wouldn't complain!